The Board of Directors and staff of Canadian Mental Health Association (CMHA), Ontario Division are pleased to present our 2017-2020 Strategic Plan, A Bold New Vision for the Future, which charts for us a clear path forward in the provincial mental health and addictions sector. This is a thoughtful document significantly informed by input we received from nearly a year of rigourous consultation with CMHA colleagues, volunteers, indivduals with lived experience, their families and sector partners. The product of this engagement is a strategic plan that helps us determine our place in the sector. It clearly defines the role that our staff, clients and other stakeholders want us to play in order to enhance the mental health and addiction system so that we can all thrive and be well, no matter who we are or where we live. The staff at CMHA Ontario is eager and invigorated to implement the priorities laid out in this plan to influence our work and better support our 30 branches across the province. We hope you share in our excitement and enjoy reading our 2017-2020 Strategic Plan. Incorporated in 1952, CMHA Ontario provides community-based programs and services across the province to meet the needs of individuals seeking support with their mental health and addictions. Our 30 local CMHA branches serve approximately 100,000 Ontarians annually. CMHA Ontario is a trusted advisor to government and we actively contribute to health systems development by recommending policy options that promote mental health for all Ontarians. We are a not-for-profit, charitable organization funded primarily by the Ministry of Health and Long-Term Care. The CMHA family stretches beyond this province. We are part of a nationwide CMHA federation that includes more than 10,000 staff and volunteers in more than 100 community locations. CMHA is the oldest health charity in the country and will celebrate its 100th anniversary in 2018. In considering the development of our new strategic plan, the Board of Directors of CMHA Ontario reflected on several fronts to begin creating a path forward. First off was a review of what had been accomplished during our last strategic plan (2014-2017). How well did the plan guide and direct our course of action? Did we accomplish all that we had hoped to during its tenure? Did we stay on track? Was it relevant? Second, board members considered how best to learn about what was truly important to the clients we serve, and how best to engage them and their thinking about where we should focus our energy. Third, we needed to ensure we create value for our branches and partners each day so that, as a collective, we can provide the very best care to those living with their mental health and/or addictions issues. We asked ourselves, how do we consult in a meaningful way? How do we ensure that our branch colleagues, partners and the consumers we serve have meaningful input into the direction of our organization? As these questions arose during our initial discussions, it became clear to the board that its priority was to spend significant time engaging all relevant parties in our organization. This outreach would include our clients, branch leaders and staff, partners, government, funders and the general public. Clearly, this would take time and care, and a decision was made to have a thoughtful approach, and to not rush the process. Over the course of a year, we consulted in earnest. We focused our energy and resources throughout 2016 to reach as many as we could and to gather as much information and feedback possible. With the assistance of our skilled facilitator, Catherine Anastakis, our planned consultation included travel to 14 different locations in Ontario to seek input from our branch partners. All 30 branches had the opportunity to participate, and they all did. Some traveled considerable distances to invest their time in ensuring their voice was heard. Where necessary as we traveled, we used technology to connect others to the conversations. These consultations heard directly from our branch executive directors, chief executives and board leaders as well. In addition, we wanted to ensure we heard from as many CMHA staff members as possible so we provided further opportunity for feedback through online surveys. Of utmost importance, we engaged clients and their families through surveys, and found excellent feedback. While all of this formal consultation was happening, we were also interviewing our external partners for their input and feedback. This included the partners we work with each day, as well as those who are part of the CMHA family, including our provincial colleagues across Canada. Finally, but just as importantly, we provided opportunities for the general public to provide input, through our website and social media channels. We were particularly interested in learning from those who may or may not have an existing relationship with us. 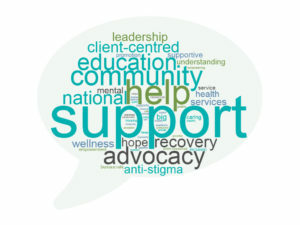 We asked them what they thought of CMHA and how can we ensure we’re relevant for those seeking help? Overall, we had high levels of engagement across all platforms: in person consultations, interviews, surveys and social media interaction. 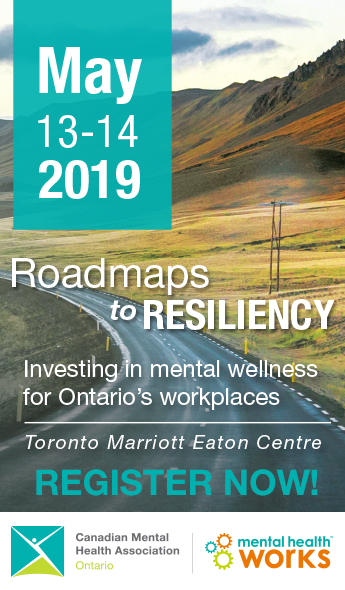 We did not miss an opportunity to further engage along the way, including a presentation about our work at the CMHA Ontario conference in the fall of 2016. We presented in full the rich feedback we received to our board in November, a full nine months after the initial decision to undertake extensive consultations. Undertaking a comprehensive engagement process indicated to us that it was necessary to re-examine the existing core statements which had guided us as an organization. While we discovered our Values remained largely consistent, there was a requirement to narrow our Mission and Vision. Creating more precise statements in these areas provide our organization with greater clarity, guidance and direction. Several themes emerged from our consultations and we categorized them into 10 core directions. These 10 core directions, at a high level, are over-arching considerations for our work over the next decade. Each core direction contributes to our strategic priorities but they also act as relevant touchstones, reminding us of the foundation from which we are working. Building on our core strength of partnership, we will continue to be a leader of change, improvement and innovation within and across sectors to better meet the needs of all Ontarians with or at risk of mental health and addictions issues. As mental health and addictions issues can affect all aspects of life, we will continue to work with other organizations, sectors, governments and funders, to strengthen and develop new and innovative partnership opportunities within and across sectors. Reflecting our strong belief in the interconnection between physical and mental health, we will facilitate and support stronger relationships and innovative partnerships between primary care and mental health and addictions services both provincially and locally. We also will support the local provision of primary care for those with mental health and addictions issues. We will make quality improvement an essential component and focus of all that we do, striving for excellence both within CMHA and in our ongoing work and collaboration with others. While continuing to seek broad opportunities for leadership growth, we will identify a small number of strategic areas for special focus that contribute to improved mental health and addictions services for all Ontarians. We will contribute to reconciliation by seeking opportunities to learn from and partner with organizations that provide community-based mental health and addictions services for Indigenous peoples. We will strengthen our change management expertise and capacity to support system change both provincially and at the branch level to help create a mental health and addictions system that is innovative, nimble and responsive. We will continue to work collaboratively with CMHA branches to further our shared commitment to outstanding community-based mental health and addictions services and to provide leadership to advance the mental health and addictions system locally and provincially. As part of our commitment to improve the whole mental health and addictions system, we will work with our CMHA colleagues to strengthen and better leverage the CMHA brand with an emphasis on quality services and collaboration. We will demonstrate our commitment to staff by creating a positive and supportive workplace culture of accommodation, equity, staff engagement and growth. 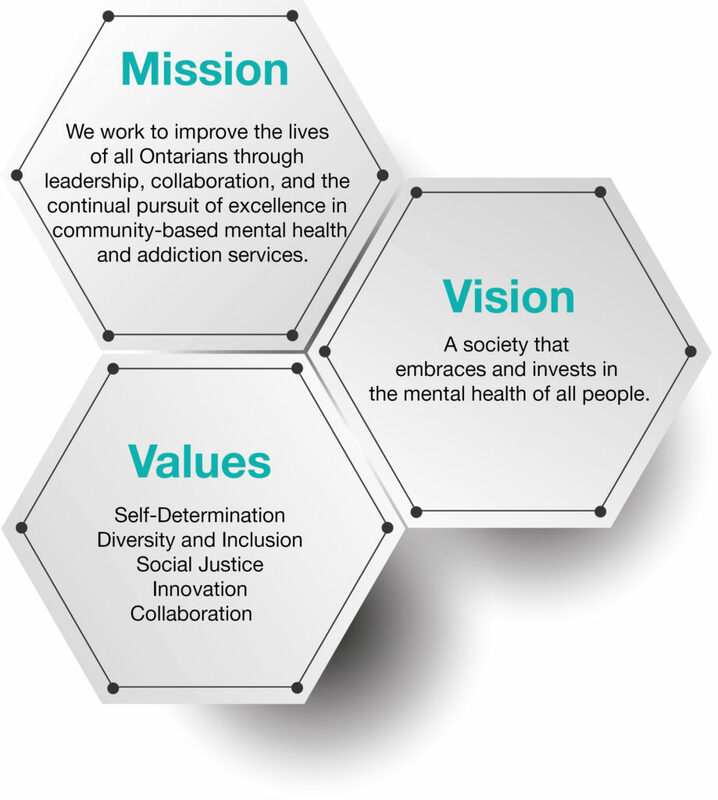 From the 10 core directions, the board and staff from CMHA Ontario agreed that several strategic priorities emerged. These are the priorities that will drive our agenda for the three-year lifespan of this strategic plan. Invest in growth and expansion of programs currently run across the province that reach individuals at all ages and stages of life. Growth may come in many forms. Growth in education can help ensure that the benefits of positive mental health are known by consumers. Growth in advocacy can result in additional funds which would help with expansion of branch programs. Growth can also result from shifting existing resources to priority programs and services. Continue CMHA’s long-held tradition of providing public education about the importance of mental health. We will use current research and implement best practices identified by Ontario’s Mental Health and Addictions Leadership Advisory Council to inform and expand mental health promotional efforts. Seek mutually-beneficial partnerships with other organizations to promote programs and services that specifically help distinct age and population groups. We will leverage our communications capacity to enhance relationships. Through formal processes and third parties, recognize CMHA Ontario as a leader in quality improvement in community mental health services. Continue groundbreaking efforts of our quality improvement program, ensuring that quality and continuous improvement is embedded in organizational cultures locally and provincially. Use tools to continually monitor both status and outcomes of our work while adhering to our strategic plan. Continue to exercise relationship-building with government and funders responsible for our sector and our work to ensure that our influence is helpful in guiding public policy. Seek “value-add” opportunities to assist in system change at the provincial and community level. Use tools to continually monitor both status and outcomes of our work while adhering to our strategic plan. Work to engage all Local Health Integration Networks about the importance of our sector and our work. Include cross-sectoral collaboration to expand opportunities for service delivery. Assist branches with integration opportunities initiated locally. Build on and expand CMHA-led programs to capitalize our reach with distinct populations, thereby maximizing how we deliver programs provincially, nationally and internationally. Expand existing relationships for mutual benefit. Engage in ongoing priority setting for staff and build in awareness of capacity when considering new ventures. Efforts toward achieving the goals set out in this plan have already begun. To help guide staff, CMHA Ontario has crafted an operational plan that aligns with the strategic priorities. Now it’s time to get to work, because the services we provide to enhance the mental health and addictions system is of utmost importance to so many Ontarians. It’s up to all of us to create a robust sector where individuals and their families receive the right care at the right time in their community.